From Tamashii Nations! This is no Zaku, boy! No Zaku! 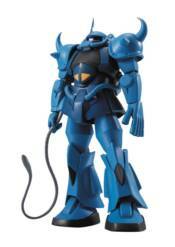 It's Ramba Ral's powerful suit, ROBOT SPIRITS MS-07B GOUF ver. A.N.I.M.E. From memory to imagination, you can relive the excitement of your favorite Gundam anime again with this Action New Imagination Memory Emotion (A.N.I.M.E.) series from Bandai Tamashii Nations! Top technology is used to create this unprecedented line of Robot Spirits. All-over joint structure allows one to pose their Gundam in anime-reminiscent poses that couldn't be made before. GOUF's set includes interchangeable hands (x6), heat sword, heat sword sheath, heat rod (long), heat rod (short), arm damage parts (x2), hand part storage deck, and shield. Figure stands 5' tall. GUNDAM HGUC 1/144 FULL ARMOR UNICORN GUNDAM (DESTROY MODE/RED COLOR Ver.) GUNDAM HGUC 1/144 GALBALDY? GUNDAM MG SWORD IMPULSE GUNDAM 1/100 GUNDAM MG1/100 DEATHSCYTHE HELL EW VER.